Tia Carrere as Shi? Maybe. 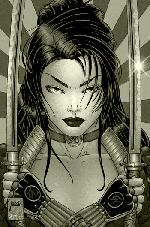 Shi creator Billy Tucci spoke with The Detroit News Comic Book Continuum recently and said a Shi live-action movie starring Tia Carrere is being targeted for a spring of 2000 release. Tucci didn't want get too excited about it because "you always hear horror stories, but they're pretty jazzed about it and they seem ready to go." Tucci, who has already written and handed the script in to producers, says his version is based on the original Shi: Way of the Warrior maxi-series. Tucci (who co-wrote the story and script with Peter Gutierrez) will produce Shi with Elie Samaha, Carrere's husband. Ashok Amitraj and Kevin Bernhardt will be executive producers, with Tracie Stanley and Malee Nevenhausen as co-producers. Tucci stated they were to shoot it in Toronto and New York and that Carrere has been signed on. "They've announced it at the Cannes Film Festival, and they've paid me to write the script." Carrere in the role as Shi isn't completely new. Tucci said he made contact with Tia about the Shi movie some three years ago. He believes she would be ideal for the role. "Look at her. She's just perfect for the part," Tucci said. "She loves the comic, and she loves the character. She's very enthusiastic and by her being so enthusiastic, it's contagious; so I am enthusiastic." Click here for poster of Carrere as Shi. "It's (the script) rooted in the age-old revenge story but we want to take it further than that and to a sensibility that's a little more current. A large part of what makes it attractive is the juxtaposition of East against West. A lot of the Eastern culture, set within Manhattan provides a very interesting backdrop." Bernhardt and Tucci have set a target delivery of the first draft happening late this year. No casting annoucements have been made. Who will play the lead is unknown at this time.